Creating a Lifetime of Healthy Smiles!! Here at Peninsula Children’s Dentistry, our mission is to provide specialized and comprehensive dental care for infants, children, teens, and patients with special needs in a friendly and safe environment, with a focus on prevention and education for families. Dr. Purvi Zavery is a unique kind of dentist. With her kid-oriented style and fun personality, Dr. Purvi gets children excited about dental care, and helps them to develop healthy habits that will last a lifetime. Our family-oriented dental practice is built on love for children and the desire to make them comfortable with dentistry. We view each child as a unique individual who must be treated as such to accomplish our goals of a positive dental experience and quality care. We hope to establish a lifelong relationship of trust and confidence with you and your child. Part of our gentle approach includes creating a comfortable and fun environment for children. Our team is committed to family-oriented dental care and we encourage parents to play an active role in their son or daughter’s oral health. 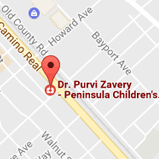 Our new, modern San Carlos, CA pediatric dental office is conveniently located next to Walgreens and Trader Joe’s on El Camino Real in San Carlos (between Redwood City and Belmont). Give us a call or schedule an appointment online! New modern office, loved by kids!